Warriors is a series of children’s fiction novels written by Erin Hunter, a pseudonym used by authors Kate Cary, Cherith Baldry, and Tui Sutherland; the plot is developed by editor Victoria Holmes. The series follows the adventures of four Clans of wild cats in their forest homes. The four Clans are ThunderClan, WindClan, ShadowClan and RiverClan. SkyClan, the long-forgotten fifth Clan of the forest, is later introduced in the stand-alone novel Firestar’s Quest. The novel SkyClan’s Destiny continues their adventure. There are currently four series, each containing six books. The first, Warriors (often called “Original Series” and “The First Arc” to differentiate it from the later series), was published from 2003 to 2004. Warriors: The New Prophecy, published from 2005 to 2006, followed the first series, chronicling the Clans as they move to a new home. The third story arc, Warriors: Power of Three, was published from 2007 to 2009. 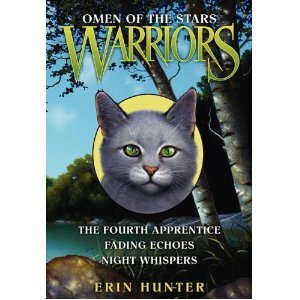 The current series, Warriors: Omen of the Stars, began with The Fourth Apprentice, which was released on November 24, 2009, and continues where the third series left off. A fifth series has been requested by HarperCollins and will be entitled Dawn of the Clans.